The Small Super Clamp from XP PhotoGear is a useful way to support lights and other photo items; without taking up floor space as a light stand would do. 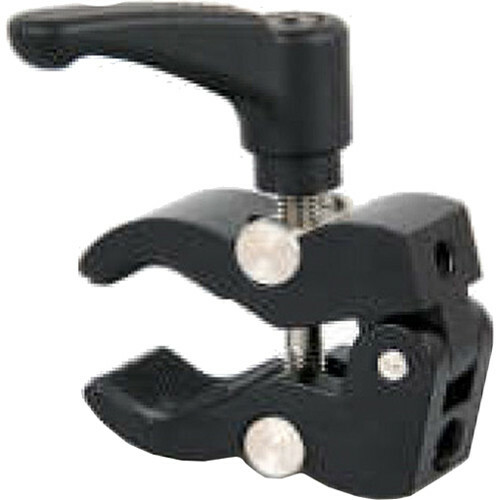 The clamp will grip round or flat objects up to 1.75" in diameter or thickness and has both 1/4"-20 and 3/8"-16 female threads for attachment of photo gear or accessories. Box Dimensions (LxWxH) 3.4 x 2.6 x 0.9"
Super Clamp (Small) is rated 3.3 out of 5 by 3. Rated 4 out of 5 by Jim from Very Good Solution I use this to clamp my Juicebox Magic Power 2.0 battery pack to my tripod legs when filming wedding ceremonies. It works brilliantly! My only complaint is that the small rubber pads that do the clamping tend to slip a bit. Rated 1 out of 5 by denny from Handle is glued on, breaks immediately. The plastic handle that tightens and loosens the clamp is held on with some sort of glue. When attempting to loosen the clamp the handle slides right off. I purchased two of these and they both broke within 5 minutes of opening the package. Now they are stuck on my rig and I have to hacksaw them off. I know they are not overtightened because they would collapse the thin tube they are attached to. Please remove this product from your website!